The correct makeup for oily skin will help make a gorgeous transformation in your complexion,despite the problems. Selecting the correct makeup for oily skin will make all the difference! Having an oily type complexion usually creates a problem when choosing the correct makeup that will stay on all day with minimal touchups, not change color and become blotchy and patchy. A correct choice of oily skin makeup will give women a shine-free look, help absorb excess face oil and provide a smooth, satin finish. So, what is the best foundation for oily complexions that helps control shine, blends easily, and provide coverage? Oil free cleanser– Start off with a clean slate- A good beauty regimen should be part of your everyday routine designed for your type. Gentle oil-free facial cleansers are designed to control oil and keep pores clean without stripping essential oils. Oil free moisturizer-A “noncomedogenic” moisturizer (water based) is especially formulated to help maintain moisture and balance for oily complexions. An important step before applying makeup. A makeup primer is applied under your foundation, providing a base for your makeup application to create a flawless complexion. A primer base provides a smooth canvas for foundation to adhere to and help camouflage wrinkles, conceal enlarged pores, and to help smooth out imperfections. Primer also helps cut down on touchups by extending your makeup wear and preventing makeup creasing throughout the day. By applying this beneficial pre-make up application your complexion will look fresher longer, toning down a overpowering shine and enhancing a healthy glow. An oily complexion already comes with its own set of problems. Wearing makeup can be a frustrating challenge. People with oily skin have to choose the right makeup to avoid an unflattering, un-natural look, color changes, clogged pores and wearing off quickly. Often times oily complexions is associated with facial breakouts (zits), acne, facial scars, red face, and blackheads. The purpose of foundation is to conceal imperfections, even out tone, minimize large pores and create gorgeous illusions. Look for an oil-free long-wearing formula that conceals and covers all imperfections with a smooth, matte coverage. Make sure you read labels. Check for quality face cosmetics designed for oily complexions. To prevent spreading germs and more oil, apply foundation with a make up wedge or sponge rather than your fingers. Apply a treatment facial mask once a week. 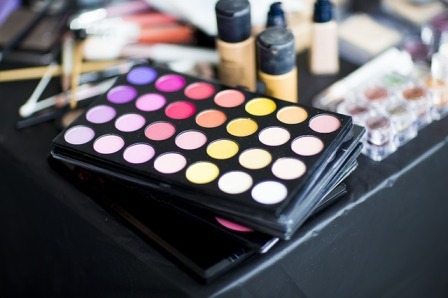 Avoid make-up products with added fragrance or containing alcohol. Fragrance often irritates skin. Alcohol will strip the skin of oil, which may cause the sebaceous glands to work over-time and produce even more. Choose a foundation makeup one shade lighter than complexion tone. Stay away from makeup that has added shimmer highlites that will draw more attention to shine. Be aware of cosmetics ingredients that can clog pores and cause blemishes such as bismuth oxychloride and dimenthicone. Titanium Dioxide- Reflects light, Sun protection. Serecite- Translucent natural illuminator, reflects light, and reduces the appearance of pores and wrinkles. Kaolin Clay- Helps reduce shine. Used for it's high absorption ability. Zinc Oxide- Major ingredient in mineral makeup. Used to calm or prevent minor skin conditions. A light absorbent face powder will help set makeup and provide a matte, air-brushed finish. It is ideal to help absorb facial oil and set your foundation for long wear. Stay clear of heavy pressed powders to avoid a thick, cakey look that will accent fine lines and wrinkles instead of camouflaging them. Light brush touchups can also be used throughout the day for oil control. Keep in mind mica and pearl powder is sometimes added as an ingredient to powders to add sheen which may appear looking greasy on oily types. Oil blotting sheets are used for touchups to absorb shine and excess oil. Blotting papers are small, thin, oil-absorbing papers that you use to pat the oily areas of your face - typically the T zone (forehead, nose, cheeks, and chin) They are designed to work by absorbing excess oil without disturbing or smearing your makeup. You can easily carry them with you on the go, eliminating the need to refresh powder or re-apply more makeup. Eye make-up can also cause complications for women with an oily type. Oil causes lines and creases to settle in the fold of the eyelid causing eyeliner and eye shadows to smudge and smear. To avoid this, do not use eye cosmetics in cream or liquid forms and apply a primer and powder application to the eyelid area before you apply your eye makeup to give you a dry base to work with. There are many varieties of cosmetics for oily skin. Choose products selectively and be free to experiment till you find that perfect makeup match.